On Wednesday, Saudi Arabia launched a series of airstrikes inside Yemen and reportedly deployed 150,000 troops supported by over 100 fighter aircraft targeting Shiite Houthi rebels who are embroiled in a vicious civil war with the majority-Sunni-run Yemeni Government. 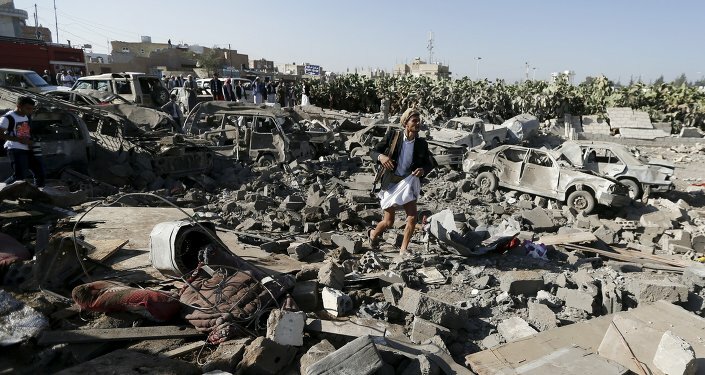 EDINBURGH (Sputnik), Mark Hirst – A major Saudi Arabian military intervention in Yemen is an outright breach of international law that could have serious consequences for the entire region, Dr. Hans Kochler, President of the International Progress Organization (IPO) in Austria, told Sputnik on Thursday. “The foreign military intervention in Yemen is a clear-cut violation of international law, in particular of Article 2(4) of the United Nations Charter, which bans the use of force in relations between states,” Kochler, who heads the organization consulting the United Nations, said. According to Kochler, the unilateral action of Saudi Arabia and its allies is not in any way justified as act of "collective self-defence" under the UN Charter. “In actual fact, it is interference in a civil war on the side of one party to the conflict, and it will make the domestic conflict even worse and much more difficult to resolve,” the professor added. Kochler stressed that Riyadh’s actions threatened to spark a major, region-wide conflict along the Sunni-Shiite divide that could have serious implications across the Arab world. Air raids carried out by the Saudi-led international coalition of Gulf nations on Wednesday killed 65 people, a local government source told Sputnik.